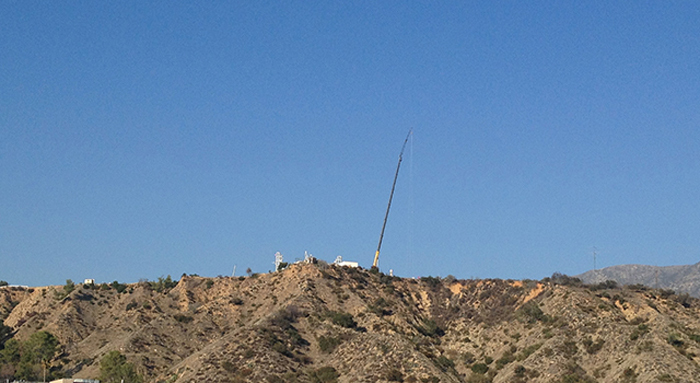 A giant crane will tower above NASA's Jet Propulsion Laboratory in Pasadena, Calif., shooting out of a hilly mesa like an oversized erector set, ready to help test components of NASA's Low Density Supersonic Decelerator (LDSD) project. The goal of the challenging technology, led by JPL, is to enable a future mission to Mars or other planetary bodies that uses heavier spacecraft and lands them at locations that were previously not achievable. The crane-test is scheduled for tomorrow, Dec. 18, weather permitting. The test will simulate the acceleration of a large parachute being pulled away from a spacecraft. The purpose of the test is to show that all of the parachute lines and bridles come out in an organized manner and do not catch on other vehicle hardware as they are deployed. Validation tests are crucial to working out the kinks before a system of this type is used for future space missions. During this test, the parachute, which has a diameter of roughly 100 feet (30.5 meters), will not open. Its size is a significant upgrade by comparison to parachutes that have come before it. For instance, last year's successful landing of NASA's Mars Curiosity Rover utilized a parachute that measured only 51 feet (15.5 meters) across, about half the size. The heavier planetary landers of the future require much larger drag devices than any now in use to slow them down -- and those next-generation drag devices will need to be deployed at higher supersonic speeds to safely land a vehicle, plus crew and cargo for potential human missions. Current Mars landing techniques date back to NASA's Viking mission, which put two landers on Mars in 1976. That mission's basic parachute design has been in use ever since, with additional landing technologies, and was used again in 2012 to deliver the Curiosity rover to Mars. To conduct more massive exploration missions in the future, however, NASA must advance the technology to a new level of sophistication. Testing for the LDSD project began in 2012 at the U.S. Navy's China Lake Naval Air Weapons Station in California and will be conducted through 2015. In the next few years, the Low Density Supersonic Decelerator Technology Demonstration Mission will conduct full-scale, stratospheric tests of these breakthrough technologies high above Earth to prove their value for future space exploration missions. Traveling 300 million miles through deep space to reach the planet Mars is difficult; successfully landing there is even harder. The process of entering the Red Planet's atmosphere and slowing down to land has been described as "six minutes of terror." During the first four minutes of entry, friction with the atmosphere slows a spacecraft considerably. But at the end of this phase, the vehicle is still traveling at over 1,000 mph with only 100 seconds left before landing. Things need to happen in a hurry. A parachute opens to slow the spacecraft down to "only" 200 mph, but now there are only seconds left and the spacecraft is approximately 300 feet from the ground. From there, the spacecraft may use rockets to provide a gentle landing on the surface, airbags to cushion the impact of a free fall or a combination of rockets and tethers to lower a rover to the surface. Landing payloads that are large enough to bring humans and sustain their survival on the Red Planet is still beyond our capability. The same parachute design developed for the Viking missions in the 1970's has been used for all U.S. missions to the surface of Mars, including the Curiosity rover that will land in August of this year. To conduct advanced exploration missions in the future, however, NASA must advance deceleration technology to a new level of sophistication. "We have now outgrown that capability and need to develop a larger parachute that will enable a larger payload," said Mark Adler, Project Manager for a new technology demonstration task at the Jet Propulsion Laboratory in Pasadena, Calif. Enter the Low-Density Supersonic Decelerator Project, an ambitious technology development and demonstration effort the likes of which has not been attempted since before the Viking missions to Mars in the 1970's. The project will test inflatable decelerators and advanced parachutes in a series of rocket sled, wind tunnel, and rocket-powered flight tests. 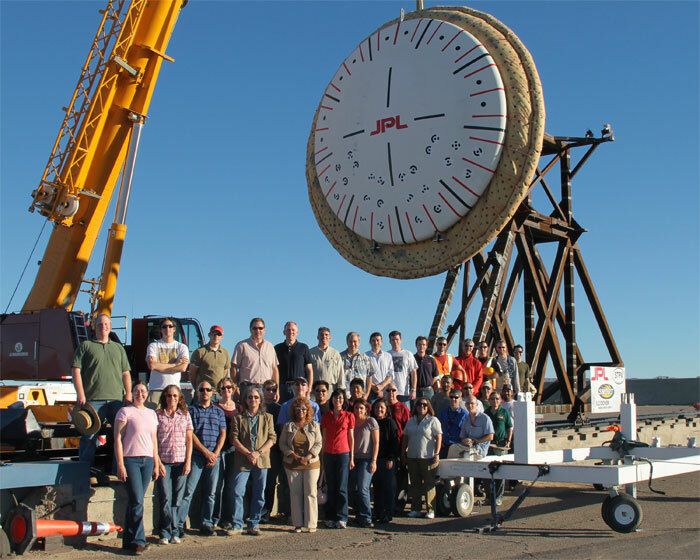 The Low-Density Supersonic Decelerator Project is managed by JPL for NASA's Office of the Chief Technologist in Washington. The mission is one of nine missions reporting to the Technology Demonstration Missions Program managed at the NASA Marshall Space Flight Center in Huntsville, Ala. The project includes three decelerators. Two are inflatable -- very large (20 feet and 26 feet in diameter, respectively), durable, balloon-like pressure vessels that inflate around the perimeter of the entry vehicle to enhance drag in the Martian atmosphere at supersonic speeds (greater than Mach 3.5) and slow the vehicle to Mach 2. The third device is a parachute measuring 110 feet in diameter that will further slow the entry vehicle from Mach 2, or nearly 1,100 mph, to less than 175 mph. All three devices will be the largest of their kind ever flown at such high supersonic speeds. These kinds of devices are often tested in a wind tunnel prior to flight; however, the parachute is so large that it will not fit inside any existing wind tunnel and the inflatable decelerators are too large for current supersonic wind tunnels. Thus, a series of rocket sled tests will begin early next year at the U.S. Naval Air Weapons Station at China Lake to replicate the high aerodynamic forces each of these structures would experience during entry and descent at Mars. One set of tests will accelerate an aeroshell 15 feet in diameter to 300 mph in just a few seconds using a rocket sled. The inflatable decelerator will then be deployed to simulate the stresses it would see during flight. Another set of tests will attach a parachute to the rocket sled to verify that the parachute will be able to withstand the forces expected during supersonic flight. The technology development effort will culminate in a series of flight tests, in which an Apollo-sized capsule is lifted to an altitude of 120,000 feet -- to simulate the thin Martian atmosphere -- using a balloon and accelerated to Mach 4 using a rocket. The decelerator systems are then tested almost exactly as they would be used at Mars, enabling future missions to confidently use these technologies to land there. Together, these new decelerators can almost double the payload mass that we are able to land on Mars. Also, because they slow the spacecraft more quickly, they will increase altitudes at which payloads can be landed by 6,500-9,800 feet, increasing the accessible surface area we can explore to nearly three quarters of the surface of Mars. They can also improve landing accuracy from more than six miles to just over 1.5 miles. All these factors will increase the capabilities and robustness of robotic and human explorers on Mars. The tests conducted by the Jet Propulsion Laboratory represent the first steps on the technology pathway to land humans, habitats and cargo safely on Mars. Rocket sled testing will continue through 2012, with a flight demonstration scheduled eighteen months later to advance the technology to flight readiness level. NASA continues to develop space technologies such as these to enable future deep space missions with exciting new capabilities for humans to explore and discover. The Low-Density Supersonic Decelerator Project will test inflatable decelerators and advanced parachutes in a series of rocket sled, wind tunnel, and rocket-powered flight tests to slow spacecraft prior to landing.